Pros: A light-hearted, charming throwback to the glory days of the Beatles; some interesting design, and of course, great music! Cons: The show lacked energy and substance – the music and visuals were exciting, but the heart and passion of the rock-and-roll legends was often absent. If you’re looking for a psychedelic trip through classic Beatles tunes, it’s best to stay home and watch Julie Taymor’s Across the Universe; if you want the full-blown catharsis of a live musical performance experience, check TicketMaster for genuine rock events happening at the O2 or other venues. 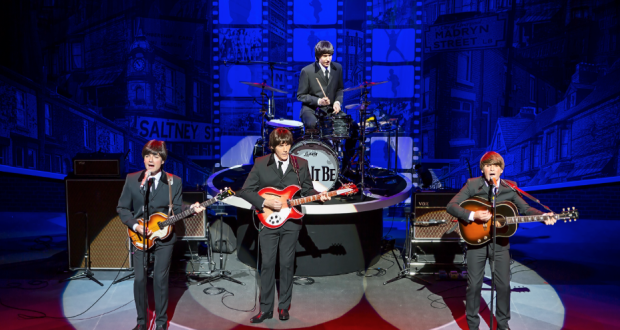 But if you’re after an easy-going evening of friendly nostalgia, look no further than Let It Be at the Prince of Wales Theatre. This 50th anniversary tribute to the Beatles reviews many popular songs from the band’s long and successful history, from the early clean pop to the later years of drug and politics inspired rock and roll. I absolutely enjoyed this celebration of music I’ve been exposed to my whole life and learned to appreciate as I’ve gotten older – who doesn’t love that feeling when a familiar, well-known tune pops on the radio, summoning memories and bringing a smile? But while the production attempted to recreate the atmosphere of a Beatles concert, something was lost in translation. 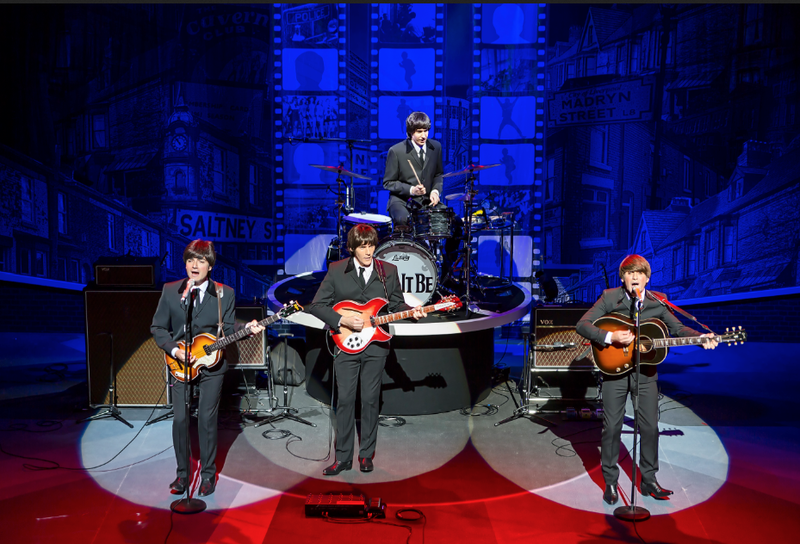 The performers sang and played their instruments with skill, attaining a sound quality and musical style perfectly reflective of the iconic foursome, but despite the flashy, accurate costuming and surprising physical similarities, the dynamic energy and pure gusto associated with the Beatles never fully bloomed in the theatre. 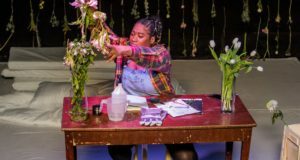 The audience was politely encouraged to join in – to sing, clap, and stand to dance, but these collaborations often felt obligatory instead of expressive; they felt like noted moments in a script as opposed to the emotional improvisations of performers and attendees at a rock concert. The lack of spontaneity was a detriment to the success of the show; often the performance felt stiff and over-rehearsed. At the outset of the production, I reasoned this could be an aesthetic to recreate the early stylings of the Beatles, who mostly stood and bopped along with their catchy melodies when they first entered the public eye. In fact, after the interval, when the more soulful, rock-and-roll era of their career was performed, a slightly looser performance ensued. It seemed obvious to me that the performers enjoyed the later work of the Beatles much more profoundly, and this contributed to a slightly less mechanical performance in the second half. However I never truly felt the performers displayed the acting chops to slip fully into the physicalities of their inspirations, and this created a mildly awkward barrier between audience and performer – it was hard to gauge the degree to which a fourth wall existed. The performers lacked the stage presence of true rock and roll musicians, therefore rendering the recreation of a Beatles show incomplete. Projection screens in the back and on either side of the band aided in creating various atmospheres as you moved through the Beatles repertoire, and in some cases, these projections proved more dynamic than the live performers, and so I found my eyes drifting often to the screens when the live band lost my attention. The show did have its successes: performances of ‘Come Together’ and ‘Lucy in the Sky With Diamonds’ stood out – both employed flashy concert lighting techniques which pumped up the atmosphere and added to concert feel, and these, along with numbers ‘While my Guitar Gently Weeps’ and the finale of ‘Hey Jude’ more effectively captured the spirit of the Beatles than many other moments throughout. I missed some personal favourites such as ‘Eight Days a Week’, ‘Yellow Submarine’ and ‘Across the Universe’, but appreciated the extensive set-list and did get to do a little twisting and shouting, so I can’t complain. 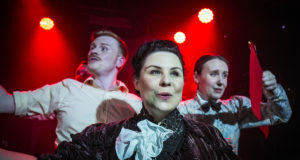 I left the theatre feeling mildly unsatisfied, but at the same time warmed by an hour and a half spent immersed in some well-played, if slightly stale musical favourites.